As we have seen, the good news is that Jesus is still living. The remainder of the four Gospels and the beginning of the book of Acts tell us a little more of what Jesus did before He ascended into the heavens. But Jesus still meets with people at the present time. How does He do this? But that is not the end, because Jesus has promised that He is coming again. Not as a baby next time, but as an all conquering Son of God in judgment to gather those who follow Him. Are you ready? If you want to follow this Jesus, come on over Here is how… You won’t regret it if you do! If you want to turn to God there is no need for delay. He is ready and willing to take you as his own – right now. You only have to ask him to forgive you and he will! Being a Christian is a partnership between God and yourself. Deciding to change course in mid-life, is what is called conversion, being born again, or deciding to be a Christian. When you place your faith in Jesus, becoming utterly dependent upon Him, you turn to God. Once you have made that decision, you leave behind your rebellion against him. As you live each day, becoming more involved with Jesus day by day, you will find yourself changing. You stop doing things which separated you from him and find yourself doing things that develop your relationship with him. How do you develop this relationship? Until you enter into that relationship, sin, or that which alienates you from God, controls your rebellion against him in your attitudes and your activities. You develop this relations by allowing God to take control of your life, as he asks you to accept his management and guidance of your life. God’s point of view and his strength will become your point of view and your source of strength. You turn your mind, will and heart to him for all you do. If you want to make that decisive step and become a Christian there are three simple steps to take. Firstly, admit that you have done wrong against God and his ways and turn away from those attitudes. Secondly, believe and trust in Jesus as your Saviour from the consequences of the anger of God towards you and your tendency to sin. Call on Him, receive, trust, obey and worship Him, recognizing him for who he is and what he has done. Lastly, accept the Holy Spirit of God into your life as the major motivating force for what you do. Once sin has been confessed, Jesus is believed in and trusted as Saviour and the Holy Spirit has entered your life, then you are a Christian. All these things happen together in a flash as you turn to God. Now you are ready to grow in grace and knowledge of our Jesus. Welcome to the family of God! God has chosen you; Jesus has paid for you and has put his mark within you through his Spirit (Ephesians 1:1-13). Play or download the audio mp3 to find out more about this Jesus, his final prayer what that means for you today!! Today we look at 3 of the principal significances of Jesus' resurrection from the dead to new life! Significance 1: The resurrection of Jesus Christ provided the central theme for the sermons and teaching in the early church (Acts 1:22; Acts 4:33, Acts 17:18) and certainly within Paul-ine theology. But what significance is there in Jesus’ resurrection? That was the Apostle Paul, writing to the Corinthian church about the Jesus having been raised from the dead – physically! Significance 2: The resurrection proved and vindicated all Jesus’ teaching and claims as the suffering Servant and attested to His being fully God and the last Judge of all mankind (Isaiah 53:10-12; Acts 2:36; Acts 3:13-15; Romans 1:4). The resurrection, declared God’s approval of Jesus obedient service and the fulfilment of all the Old Testament promises, resulting in forgiveness of sins and salvation being only found in and through Jesus Christ, which was the prime motive for evangelism in the early church (Acts 2:32, Romans 4:24-25). Jesus’ resurrection is a sign of the bodily resurrection for all believers in Him, giving a new attitude to death and transforming hopes (1 Corinthians 15:12-58, Romans 8:10, 2 Corinthians 4:14; 1 Peter 1:3 & 21). As the resurrected King, Jesus now intercedes for us and has perfected the redemption of all those who choose to follow Him (Romans 5:10; Hebrews 6:20; 1 Peter 1:21). Significance 3: Finally, the resurrection of Jesus’ physical body is a sure victory over satan, sin and death. All three are conquered and squashed. Satan is a defeated creature and will do anything to drag people into defeat with him. The power of sin is conquered, and sin’s grip is overcome if you are a believer in Jesus Christ. Finally, as I said earlier, death has been beaten, because those who believe and trust in Jesus Christ will live forever with him – death is not the end but a beginning. If Jesus Christ did not physically rise from the dead then as Paul states in 1 Corinthians 15:12-19 “Now if Christ is preached, that he has been raised from the dead, how do some among you say that there is no resurrection of the dead? But if there is no resurrection of the dead, neither has Christ been raised. If Christ has not been raised, then our preaching is in vain, and your faith also is in vain. Tomorrow we conclude our Easter 2016 with Jesus still meeting people today. All of these theories are incorrect... Jesus really did rise from the dead to new life. Tomorrow we look at some of the significances of this historical event. Notice the changed attitude of the disciples after seeing the risen Jesus. They changed from defeated, cowardly people to victorious, brave people. Nobody who could have produced the dead body of Jesus, did so. Their silence is as significant as the preaching of the Apostles. Or take the multiple appearances of Jesus to various numbers of individuals and groups of people at various times of the day and in differing circumstances. This shows that Jesus’ resurrection was physical in nature! Some people say Jesus’ resurrection was spiritual in nature but not physical. But the amount of people that saw Him physically afterwards dispels that particular myth. What about the current tangible evidence - the survival and inordinate growth and impact of the early church and that the church is still growing 2000 years later. If there was no bodily resurrection of Jesus, would people really have risked persecution and death for knowing a lie? One or two people maybe, but not hundreds and thousands! In our podcast tomorrow, we look at alternate theories for Jesus' resurrection. 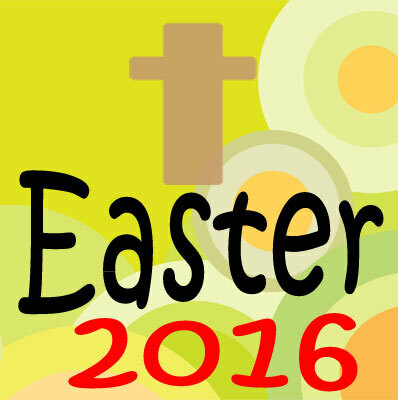 Easter 2016 - Jesus is Alive! Part 20: Jesus is alive! WOW! Jesus is sealed within an unused and guarded tomb. Or is he? The historical records say differently...All four Gospels, part of the historical record, Matthew, Mark Luke and John, tell us that Jesus was crucified, died and was buried in a tomb. What do these four historical Gospels say about the Jesus’ resurrection or rising from the dead? In our Podcast tomorrow, we go to look at further evidence for Jesus' resurrection from the dead. Easter 2016 - Why the Cross? Part 19: Why did Jesus go to the Cross? what relevance for us today? Victory over satan, sin and death. Those words were spoken about the coming Messiah, by the prophet Isaiah centuries before the birth of Jesus Christ. Together, so far we have looked at during this Easter series, Jesus’ mission and identity and have placed Him as the Messiah spoken about throughout the Old Testament, including Isaiah. We have looked at Jesus’ last teaching, last prayers and the events of his last night. Following his betrayal, he is now facing trial in a Roman court, being interrogated by Pontius Pilate. So they went and found it just as He had said to them, and they prepared the Passover. Today we look at Jesus preparing and serving on His last night before He goes to the cross. Play or download the audio mp3 to find out more about this Jesus, his preparations and his washing the disciples feet and what that means for you today!! That took place now some 3 years ago. From that time till his last night, during His 3 years of ministry, Jesus has preached the good news of God’s salvation to reconcile people back into relationship with Almighty God. Through the cross, His mission will be fulfilled. 1c. Passover, Pentecost and Feast of Tabernacles were the three most important feasts on the Jewish calendar (Leviticus 21). All Jewish men were expected to visit Jerusalem (Deuteronomy 16:16). The Passover Feast was to commemorate the deliverance of Israel from Egypt, and it was a time for remembering and rejoicing (Exodus 11-12). Today we look at Jesus plans on His last night. Play or download the audio mp3 to find out more about this Jesus, his final prayer what that means for you today!! John 17:24-26: Father, I want those you gave me To be with me, right where I am, So they can see my glory, the splendour you gave me, Having loved me Long before there ever was a world. Righteous Father, the world has never known you, but I have known you, and these disciples know that you sent me on this mission. I have made your very being known to them — Who you are and what you do — And continue to make it known, so that your love for me Might be in them Exactly as I am in them. We are now looking together at Jesus' final prayer. This prayer is probably the pinnacle of revelation in John’s gospel. Here we see Jesus’ very words, revealing an unparalleled intimacy with His Father. Now Jesus prays for all those who, through the work of the disciples, will become His followers. As such, it brings all Christian disciples into intimacy with Jesus and a part of a dynamic relationship with Him. John 17:6-8: I spelled out your character in detail to the men and women you gave me. They were yours in the first place; then you gave them to me, and they have now done what you said. They know now, beyond the shadow of a doubt, that everything you gave me is first hand from you, for the message you gave me, I gave them; and they took it, and were convinced that I came from you. They believed that you sent me. We are now looking together at Jesus' final prayer. This prayer is probably the pinnacle of revelation in John’s gospel. Here we see Jesus’ very words, revealing an unparalleled intimacy with His Father. Today we see and reflect on the prayer Jesus prayed for his disciples. Play or download the audio mp3 to find out more about this Jesus, his final prayer and what that means for you today!! John 17:1-5: Jesus said these things. Then, raising his eyes in prayer, he said: Father, it's time. Display the bright splendour of your Son So the Son in turn may show your bright splendour. You put him in charge of everything human so he might give real and eternal life to all in his charge. And this is the real and eternal life: That they know you, the one and only true God, And Jesus Christ, whom you sent. I glorified you on earth by completing down to the last detail what you assigned me to do. And now, Father, glorify me with your very own splendour, the very splendour I had in your presence before there was a world. We now look together at Jesus' final prayer. This prayer is probably the pinnacle of revelation in John’s gospel. Here we see Jesus’ very words, revealing an unparalleled intimacy with His Father. Firstly, Jesus prays for Himself, then for His twelve disciples and then finally for all disciples of all generations to follow, the church. Today we are looking at Jesus' prayer for himself.